We're on our way out to brunch with Terra and Phil so I don't have time to post all the pictures I took of Kellie's finished room. However, I did have time to upload this one of the Halloween party last night. Pictured from left to right is Me, Meaghan, Diana, Sarah, and Melissa. We had a fun time last night and it felt good to get all prissified. I haven't glammed out in a while. I remember the good old Utah days of dolling up everyday. I gotta tell you, outside of Utah, that is not the norm. Go figure. 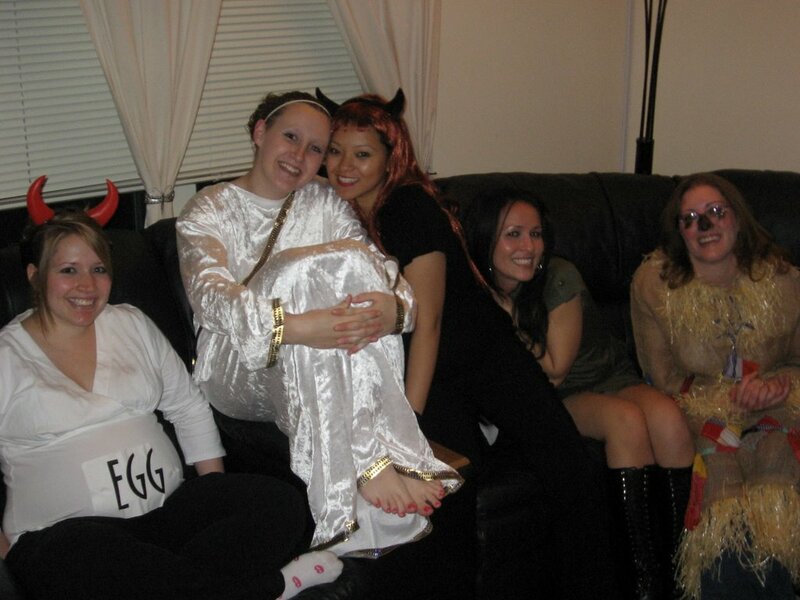 You look soooo cute as a deviled egg! I can't believe how big your tummy is!! I still can't believe you're actually pregnant, since I haven't seen you in the flesh! And by the by, every time I look at your baby shower invitation I get really depressed because I can't be there. And because I'm not the one throwing it. Sigh. I really miss you! wow! I see it but can't believe it. So weird I know you're pregnant, etc but haven't been able to see you in person pregnant so it makes it unbelievable to see the picture. You are so good at making friends, glad to see that you have a lot there. Happy Halloween deviled EGG!! !